Thank you to Larry Martin for contributing this image. Does anyone remember the air conditioning offered in the late 50s or early 60s offered by way of a vacuum hose with a flat end that you roll up in your car window along with the speaker at Coral Way Drive In? I loved going there as a kid (late 50's/early 60's). We'd get there early and I'd go play on the swing there, then watch the movie when it got dark. That was back in the days of free-range parenting, when kids in the summer would range all around the neighborhood. I feel sorry for the closely monitored kids today. They don't have the freedom we had. Iris, thank you for your comments. What you said about changes in Miami is one of the main reasons I started this section of my site. We grew up at the best time ever to live here when it wasn't so congested and there were wide open spaces all over. And thank you to everyone who has posted their comments and memories here. The comments really add more historical background than just a photo from way back when and I appreciate people taking the time to comment. Thank you for sharing these pictures. I use to go to the drive in as a teenager. It's sad to see how things have changed in Miami. I personally prefer the Miami that I grew up in the 60's and 70's. Thank you again. During the 60's we would get blankets and get on the roof of my Parent's car and watch movies here. My cousing lived on the other side of the Palmetto and we could sit on the grass up on the highway and watch movies from there. I also spent many Saturday mornings here at the swap meet looking for Penn fishing reels and rods. I still have an old Arbalete speargun in my garage that I bought at the Tropicare swap meet. Hi there! I am a journalist working on a story about old Miami drive-ins. Is there anyone who used to work or attend the Tropicaire Drive-in regularly? I would love grasp the Miami drive-in scene of the '50s through '80s. Contact me! Thank you! My father owned the huge Exxon station right next door, from around 1968 until 1971. I was a member of the team that sold tropical under the tree at Tropicaire Drive-in. I was the one with longest hair. We sold a lot of fish, it was hard work getting ready Saturday and setting everything up Sunday. Oh, did we ever meet the girls!. Those were the good old days. When it slowed down in the afternoon we would go get a six pack of beer from the Homestreach Bar. There was a guy and his wife who sold good jewelry, he ended up having several stores around town and ever advertised on tv. The Swap Meet! You could get anything there as a kid for cheap! Atari & Coleco games, Star Wars Figures, weapons! My grandfather used to go there with me as a kid almost every Saturday. Now I run a prophouse for film & tv. Thanks Grandpa! My husband and I went to this Flee market/drive in theatre when we met!! I worked here growing up at the flea market with my grandparents and uncle. Even though I was a kid I really enjoyed every moment of it! I'm so blessed to be able to attend medical school now, but I will never forget where I came from!!! I remember working at the Swap Meet through High School for the Millers. There sure was a lot of fun people working there. The Clarks, Phil Dumbowski, The Fleri's Matt and Mike, TIna, etc.... First we worked Security in the morning and trash detail in the afternoon. Used to love driving the trash truck with no doors. Hated working security in the old Chevy in the back of the lot. Who knew that by bouncing all those quarters in the box during admission would make me a College Quarter's Champ! my family moved here in 1956, i still live here in Miami. i can honestly say that i don't think i would have rather of grown up any where else. I use to go the tropical driven almost every weekend with my dad and his friends. i used to play in the play ground area. I also worked there for awhile!!! Oh how we loved going to the movies here! Wearing our PJs and laying in the back of the station wagon! Then on to the flea market when the "strong man" was there. Anyone remember him? Remember this place well. I use to go there with my parents in the late 50's and early 60's .then in my own car in the late 60's with my friends and our dates. Loved that back row. Then later with my wife and my kids. Long live those old memories. You just "thought" you did it. This Drive-In and the Coral Way Drive-In on the south side of Coral Way around 70th Ave just west of Coral Terrace Elementary School were favorite hangouts in the 60's with car loads just as Ray described "sneaking" in. It was demolished in the late 70's and the Tropicaire was replaced with a strip mall. I was born in Miami(1962),when I enlisted in the Marines(1982),I had some "poolee" meetings at the theatre office. Picture it..... 1968 Chevy Impala, with 5 people inside the car and 4 more inside the trunk. I did this several times at the Tropicaire Drive-In and never got caught. This is such a great picture to bring back memories of old Miami. I miss the old Miami. Hello everyone. The ramp, the foot bridge across the Palmetto where you could watch the movie sans sound, will be demolished in a short while. A new bridge is being erected just a bit north from there. I've taken photos of the foot bridge at various angles and even snapped pictures of graffiti etched into wet cement possibly when the bridge was built. I believe the writing dates back to 1977. I proposed to my ex-wife on the corner of the bridge that faces where the Tropicaire used to stand. That was back in 1984 or so. I still use that bridge, to this day, to sprint when doing HIT cardio. I've been taking picture of Bird Road, etc. when I go for my walks. My god, this is where I got recruited for the Marines back in 1980....lmao! We were here as kids, mom would bring us...Saw King Kong VS Godzilla, Hold on Herman's Hermits movie,and so many others. Later in life did the Flea Mkt. George, we would sure like to see those photos and Norman all those places were special especially the Ludway, Central Stadium, and the Royal Castle that actually was not on Coral Way but down the dead end street right in front of the Central Stadium entrance. George Drakopoulos - My friend Peter Koukios turned me on to this site. I used to work at the Tropicaire Drive-In in the 1980's and was there for the very last movie. We tried to get "The Last Picture Show" but could not. The last movie was shown on December 27, 1987 and was Stake Out. It was definitely a sad day for all of us who grew up there. I used to walk the theatre with old Jesse Tucker busting people actually still sneaking in the trunk of their car. I remember when they showed The Omen there and the traffic was backed up the off ramp of the Palmetto. I was there the day they started to tear it down. The first time the wrecking ball hit the screen, it bounced off. Channel 10 interviewed me and as a former theatre employee, I was included in photos taken along with the owner, Mr. McComas who also gave me a beautiful autographed aerial shot of the theatre taken right after it was built in the 40's. I also have some glass blocks from the building along with speakers that were used before they went to radio sound. I do not live in Miami anymore and have not for years but my memories are great. As a child, I also remember going to tropical park with my uncle when it was still a horse track sitting on his shoulders watching the horses and jockeys parading by. Thanks for the memories. George D.
I remember the drive in at Coral Way just east of the railroad tracks. Today it is the site of a car dealership and an appartment complex. I remember the air conditioning and watching movies with my uncle Ray and his former wife Linda. I know you guys remember Central Stadium where the boring Blue Lagoon shopping center know sits. Do you remember the Royal Castle there? Yikes, I'm 54, I've gotten old. Remember Pirates, the gaming center? Wow this site is great. By the way, the FEC (not the old CSX) tore up the tracks just west of 67 th. Ave. and Coral Way. Remember the old Ludway Bar since "1947?" Great place for a quick beer and smoked fish. Hello Ernest. Im a little younger than some folks here but I went to the Flea Market there every single weekend for nearly two decades with my Father and older brother. I was so disappointed the day they started tearing it down. Just to give you guys an idea, my parents tell me the first movie I ever saw was Star Wars, on that very screen. I loved going to the flea markets here, what great memories in the early 70's and mid 80's I think as a kid I bought some of your baloons because I remember walking out of there and inhaling the helium, I remember the homemade roach clips and the incense that used to be sold there, tropical park across the st. when horse racing was there.what fun to remember these good times. Oops, that was 86th ave. Had to turn off Bird onto 87th I believe, to get to 86th. There was a Royal Castle at Bird and 87th if memory serves. 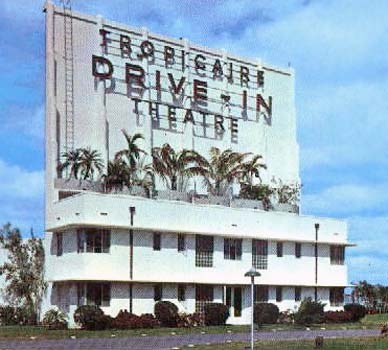 The Tropicaire Drive In is one of my fondest childhood memories. I lived in Miami from the early fifties until 1960. We lived on 87th Ave. just off Bird road. If memory serves me I went to Emerson Elementary in the 1st grade and then to Banyan in the 2nd, 3rd and part of the 4th. My father worked for the City of Miami in the landscape dept. But, his second job was as a cook in the snack bar at the Drive In. Of course, this entitled my family to free admission so especially in the summer while school was out we saw many double features. We would always arrive early before dark and my brother and I would walk the parking aisles searching for change dropped by careless movie goers. Some evenings we did quite well. But about dark we would have to be sure to be in the car with the windows up as there would be a truck coming thru spraying/fogging for mosquitoes. I believe they used DDT at that time. I was first introduced to pizza at the theater. I can still smell and taste it till this day. I am sure it was just a premade boxed pizza but I have never tasted one better. Ah, the theater is gone, my dad is gone and my brother is gone but the memories will be with me forever. My Parents still live a few blocks from here on S.Waterway Drive. Tropicaire Drive-in was where I saw The Omen, What's Up Doc? and many many others with friends and family. Sad its gone and thrilled to see the great photos here. What a treat. I also would go on weekends to the flea market for years, Stuff bought there, I still have and cherish. When low on funds, friends and I would hang out at the catwalk over the Palmetto (still there) and watch the movie for free. Albeit without sound. Thanks for the opportunity to see these great images. the best flea market - EVER! Check out the picture and article about the in car airconditioning near the bottom of this section. I remember it at the CORAL WAY DRIVE-IN. Was it worth the 50 cents extra? You bet it was. The downside was no steamed up windows..........Privacy if you know what i mean. I can't believe someone else remembers the ac at the coral way drive, great memories at both in the 70's. There's a foot bridge over the Palmetto just north of Bird Road. We used to cross it and watch the movies for free. The last movie I saw there was circa 1984. My friend Richard Bradwell and his wife Nancy (Neighborhood Fish farm) sold tropical fish there under the trees every weekend for a long time. It was .25cents to walk in. I am Bob Cleve (CGHS Class of 1955). My family and I used to go to the Tropicaire in the early 1950's. We loved those wonderful warm evenings under the stars waiting for the show to start. Later, when I discovered girls, I would take them there in my dad's car (minus my parents of course!). I used to earn gas money for my 1939 V12 Lincoln Zephyr and some movie money at certain times of the year by walking horses from the railroad stop to Tropical Park race track. Geez, time sure does fly by fast doesn't it? God bless you all and be well. This was around as late as 1987. I saw Predator there at that time. OH MEN I REMEMBER THIS DRIVE IN. EVEN THOUGH I WAS BORN IN 69 AND NEVER WENT THERE EXCEPT FOR THE FLEA MARKET ON THE WEEKENDS I STILL MISS IT. WE CAN BLAME HURRICANE ANDREW FOR TAKING THIS LAND MARK AWAY. WHEN I WAS AKID I COULDNT WAIT TO BE OLD ENOUGH TO START DRIVING FOR I CNA GO THERE. I WENT THERE ONCE WHEN I WAS IN HIGH SCHOOL (SOUTHWEST HIGH) WITH FRIENDS. I THINK I WENT THERE ONCE ALSO WHEN THEY HAD A CARNIVAL I WEN TWITH MY PARENTS I WAS ABOUT 3 I GUESS. I WISH IT WAS STILL THERE. I GET MAD WHEN I SEE ALL THE LANDMARKS GO TO THE RECKING BALL. This was fantastic, architecturally significant commercial architecture. What a shame! My parents would never take us to drive-ins, but I always looked for this landmark, as my parents drove to Dadeland, from Flagler, in the late 60s/early 70s. We used to drive off with the speaker way too often! In future archeological digs when they come across a hilly area with some poles remaining and a large white wall at one end will they decide it was used for religious ceremonies? and 1970. Frank was Australian and his speciality was repairing British cars. If my fading memory serves me correctly, there was another smaller sign to the right (?) of this one that had the movies listed on it and the long time advertisement that read, "Swap Meet All Day Sun". I never knew what that meant while growing up. We only went to the Tropicaire Drive-In when nothing good was playing down south at the Dixie Drive-In. How many of you ever drove off w/ the speakers still attached to the window? Dad did and all he would say was #$%@& speaker! I started going here in the 1950s. I remember it well , lived down the road on 82nd. ave. I also will never forget the day they tore it down. Very sad. i have the snack bar signs from here! gave the guy at the gate $5 so i could yank them off before the bulldozer got to them! I remember when this was a flea market! WOW! thanks for the memories! Wow...this is GREAT. I grew up a few blocks away on S. Lake Dr. I started going to this drive-in back in the mid 50's. In fact I signed up for the Marines in 1966, at the old USMC Recruiters trailer that was on this property next to the front entrance. Used to sneak in under the fence in the back when I was a kid. Plus, we would sneak friends in, in the truck of our cars during high school. Lots of memories of this place. The 'great' month in my life was December 1967. I soloed in a Citabria at Homestead General airport. I also 'did it' first with Jo-Jo at the Tropicaire Drive in. Such is life. Yep, I remember that sign well, including the palm trees growing on it, which I always used to love. I was born in 1959, and moved from an apt. to a house 2 blocks from Tropicaire Theatre, living there from 1960. In the 80's I moved to an apt. in West Miami. 5 years ago I moved from Miami to Central FL. Wow I remember that in the 80s etc.. Now its another old stripmall area with a Best Buy and furniture store etc.. one of many cloned shopping malls that litter Miami today. Sad to see these pictures and see what has become of Miami today. Thank you! Thank You! Thank You! Larry Martin & Don Boyd!! !